Waved the car off with a tear in my eye but it has gone to a great new home with @DanAth. Great to meet you Dan and your Dad today. Happy Westfielding. 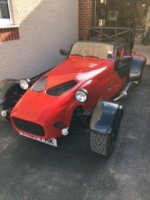 Due to personal circumstances I am having to sell my Westfield with red FW bodywork. The car was bought in modular form from Westfield starting in Autumn 2013 with the build finished in December 2017. IVA passed first time in December 2017 and registered in January 2018. 1990 miles completed with no problems in 2018. 2.0 L Zetec blacktop engine with Raceline sump Omex ECU Jenvey throttle bodies Type 9 gearbox Wide track front suspension Team Dynamics wheels with Toyo R1R tyres Carbon effect cycle wings Carbon effect rear stone guards Carbon effect rear diffuser Carbon NV indicator pods Carbon NV roll bar bolt covers Westfield Sport Turbo seats MSA rollbar 4 inch Dominator headlights Soft Bits for Sevens tunnel bag Westfield doors and wind deflectors. Heated windscreen but no heater The standard FW spats, headlights and indicator pods have been removed and replaced with Dominator headlights and Carbon NV indicator pods. I have a pot of red gelcoat which I was going to repair the holes in the bodywork with but I will leave these open in case new owner wishes to revert. I would like the car to go to someone on the forum who will continue to develop it and hopefully I can follow its journey. All receipts have been kept Asking price £14750 but open to sensible offers. Please PM me with any questions. This is how I did mine. The bungy cord gives a bit of flex when trying to fasten the door and also a bit of movement when manoeuvring . The catch is part of the bonnet catch. What a great idea. I hadn’t thought of that!! Never heard it done like that but sounds very sensible. I suppose some fibreglass sheet on the inside once done. Oh yes, one either side!! Looking for the best solution to fill the holes where indicator pods and spats were fitted. Fibreglass repair and gelcoat? Black bolts? Cut some carbon fibre discs and stick on? Most definitely not. I certainly don’t always post a comment but love reading yours and others build diaries. A valuable source of information for reference. Great idea. Looking forward to the next one. Thanks @Rory's Dad and @Dave Eastwood (Gadgetman) - Club Secretary. It is all stuff that can be done off the car and in the open air. Have used Dremel attachments for cutting and filing GRP. Are these ok on carbon fibre? Are these the same size as you used to fasten your spats on only in black? Looking for something similar to fasten my carbon cycle wings on and can't decide on silver or black.